Ok! I have been promising this for a very long time indeed. Better late than never, right? So what I’ve been doing is listening to the commentary episodes, right up until the time the commentary itself starts. Then I note the time and switch it off. That way I can come back later when I have the Who story (and my knitting) at hand. The waiting is actually helpful in some cases–for example when a podcast does commentaries on an entire season. You see, I listen to podcast back-catalogs in reverse order. I like to start at the present and work my way back. It’s fun! But watching a season of Doctor Who in reverse order is less fun. To avoid getting terribly confused when it does come time to catch up on commentaries, I’ve done one of my other favorite things: created a spreadsheet! This way I can keep track of the Doctor Who stories, the podcast episode numbers, and the time in the podcast when the commentary gets rolling*. Several people asked if I’d be willing to share this spreadsheet, and (of course) I am! It’s sorted by podcast, then organized in the (rough) order in which I plan to watch them, so I apologise if it seems a bit confusing. Also, the last column has notes that mean nothing to anyone but me. Feel free to download it and change it around as you like (assuming you’re as big a nerd as I and would actually want to do such a thing). I’m constantly adding to it, so I’ll probably post updates occasionally if it seems like anyone would be interested. Frankly I’m shocked that anyone was interested in the first place. Incidentally, if you’d like a bit more information about the podcasts that are referred to in the spreadsheet, I encourage you to check out my previous entry here, Podcastastic. I do a quick rundown of what I’ve been listening to lately. *Note that the time listed is the moment at which Steven from Radio Free Skaro says the words “legally purchased DVD” (or whatever the analog of that is on the other podcasts–Josh sometimes remembers to do that on DW:MHC as well). Ok, so I haven’t posted anything lately. That’s because I also haven’t knitted or watched much Doctor Who lately. However, what I have done is listen to oodles of episodes of Doctor Who-related podcasts. (I’ve mentioned before that I listen to several.) Well that’s what I’ve been up to. You know how when you (and by “you,” I mean “crazy people like me”) discover something new, well new-to-you (again, meaning me) that’s really really super awesome, and you (me) just throw yourself (myself) into it headlong? That’s pretty much what happened to me and the apparently-very-wide world of Doctor Who podcasts. Don’t get me wrong, I only listen to a teeny-tiny, itty-bitty fraction of what’s out there. I’m sure there are heaps and buckets of other awesome podcasts I haven’t gotten around to yet (and probably never will–there are only so many hours in the day after all). Radio Free Skaro – My first love in the world of Doctor Who podcasts, and still my favorite. Steven, Warren, and Chris strike exactly the right balance of informative and entertaining. Their personalities couldn’t be more well-suited to podcasting together. There’s truly something for everyone. It doesn’t seem to matter whether they’re rehashing the news or doing a commentary, I find myself laughing out loud regularly (sometimes even during the multitude of interesting interviews they get with the behind-the-scenes folk of the Doctor Who world). I’m not sure how they manage to sound so professional while simultaneously being ridiculous and off-color, but they pull it off brilliantly. The TARDIS Tavern – Sean and Steve have created a virtual pub at which I would give my eye teeth to become a regular. Seriously, if this place really existed, I would become an alcoholic in no time. I find it hard to imagine a better time than sitting around, drinking, and talking about episodes of Doctor Who. I would love to hang out with these guys. I whipped through the TARDIS Tavern back-catalog faster than that of any other podcast! While I haven’t adored every guest “bartender” they’ve had, I do appreciate the variety of opinions they get by having so many different folks pass through the Tavern. I love being a proverbial fly on the wall there! Doctor Who: Mostly Harmless Cutaway – I actually have TARDIS Tavern to thank for my fandom of DW:MHC. I adored the Tavern’s frequent guest host Josh so very very much that I just had to find out what his other podcast was like (and have since determined that I would follow him anywhere). Turns out it’s a great podcast in its own right. Mastermind Eric runs a pleasingly-not-so-tight ship that, in addition to Josh, often includes guest cohosts such as Sean from TARDIS Tavern, Cat from Sci-Fi-Party Line (a fun podcast that covers all kinds of sci-fi), and a droll Austrailian fellow whose name seems to change with each appearance. Listening to these folks is the closest I get to sitting around chatting Doctor Who with a room full of friends. Good times indeed! The Doctor Who Book Club Podcast – This was another case of following a podcaster I like–well two, actually. I loved Sean on TARDIS Tavern and DW:MHC, so it seemed natural to check this out, but I hesitated because I don’t really read Doctor Who books. Then I heard an episode of DW:MHC recorded at Gallifrey One** that prominently featured DWBC-cohost Erik. I was sold immediately. It doesn’t even matter that I don’t read the books. I love hearing Erik and Sean talk about them, and I look forward to hearing the guest-readers they have recite passages from the books they review. For not being a fan of audio books, I really enjoy that bit. Probably because they seem to get such excellent talent each month. *It may not look “very quick,” but trust me, I could go on and on (and on) about each of these. **I’m told Gallifrey One is the world’s premiere Doctor Who convention. I’ll get to find out in February, as I’ll be attending for the first time. So exciting! I will probably be starstruck meeting all these podcasters in person. ***I know, I know. It’s pretty lame. Unless you dig spreadsheets like I do, that is. I really dig spreadsheets. Last week was a special week in Doctor Who for me. 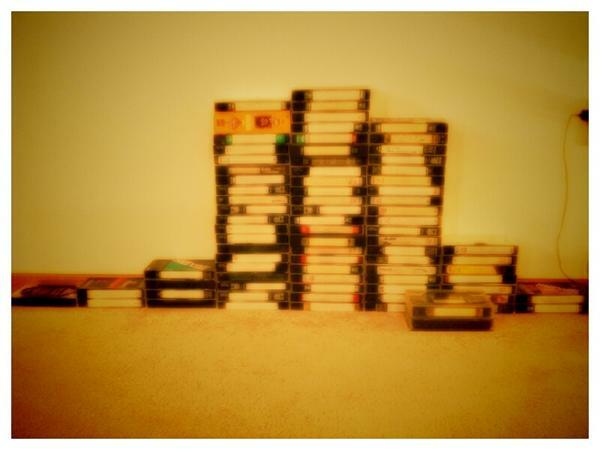 As I mentioned, I recently acquired a number of episodes on VHS. No, before you ask, I didn’t pay for them–unless the effort of lugging them from my parents’ house to mine counts. (And it shouldn’t ‘cause my dad carried them out to my car, and my houseguest carried them in to my apartment.) So as you’ve probably surmised, I snatched these from my parents—from my mom, specifically. She’s been trying to clean out the house and get rid of stuff. When she asked if she should toss them, I said no way! My original plan was to take them, sort through them, and ditch all the episodes that are easily accessible via Netflix (either streaming or on DVD). And that’s still my plan…really…uh huh… No, seriously, it is. I just wasn’t prepared for the emotional reaction I’d have to holding those tapes again. My houseguest, C, was laughing at the squeaky sounds I was making at being reunited with my “old friends,” as he called them. They really are old friends. The number of hours I spent watching (and labeling—Mom was rubbish at labeling promptly) those clunky things is beyond measure. They literally got me through one of the worst summers of my life. And then my brother came along and wanted to watch them too, so I started right back over at the beginning with him. They’re sorted by Doctor (1-8). It’s pretty clear which eras my mom favored. There are very few repeats in there. I haven’t looked through them thoroughly yet, but I think there may be three different copies of the Trial of a Time Lord season, so picture the Colin Baker stack a good deal shorter. Also, please note that almost all of these were recorded on EP, which means there’s about 6 hours of Doctor Who on each tape. So this should give you an inkling of what it was like to grow up in my household. Doctor Who took precedence over just about everything else. In fact, there was one time in particular when Dad had a friend visiting, and the Green Bay Packers were playing some important game at the same time Doctor Who was on. Catastrophe! 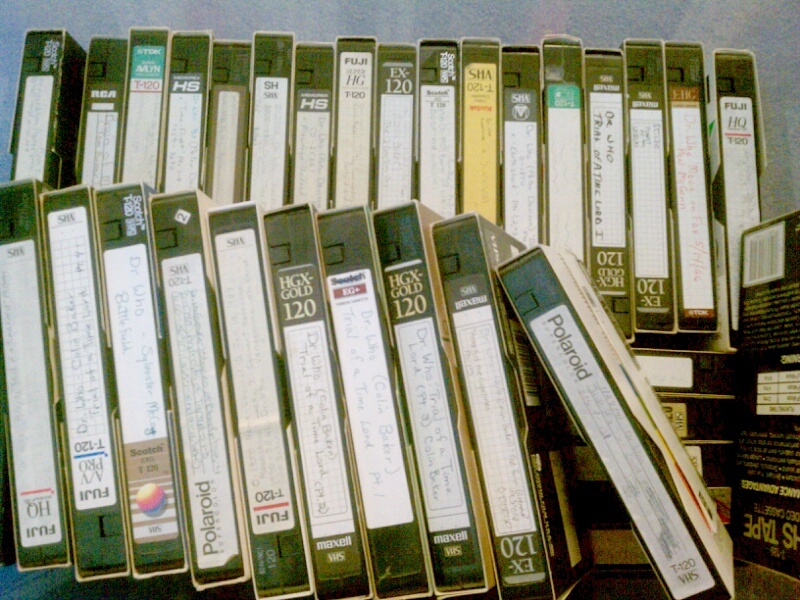 That particular problem was solved by Mom renting a motel room for that Sunday, taking the VCR, and taping it there. Come to think of it, that wasn’t the only time Mom went to a motel in pursuit of Doctor Who. One weekend the Madison PBS station was having a Doctor Who marathon. Problem: we lived near Milwaukee, so we couldn’t get the channel. Solution: Mom got a motel room halfway between Milwaukee and Madison, took the VCR, and spent the entire weekend taping Doctor Who. It’s worth pointing out that we were not exactly well-off, and renting motel rooms (and even shelling out for VHS tapes) were not insignificant expenses for us. But for the good Doctor, ‘twas all worth it. One thing I meant to do and forgot was to go through Mom’s box o’ memorabilia. I think she got rid of some stuff over the years, but I know she still has a bunch of items from the various cons she attended back in the day. She’s got autographs from most of the actors who’d played the Doctor by that time, old fanzines, bookmarks, lots of neat stuff I only half-remember because I wasn’t allowed to look at it unless she was there to make sure I didn’t ruin anything. Maybe next time I’ll remember to delve into that treasure trove of memories. Until then, I’m well-fixed with my precious precious videotapes. Scoff if you want, but right now, the cockles of my heart are about as toasty as they get.